Hashemi, M., Hossein Mirzaei, A. (2014). The Evaluation Status of Dairy Cows Nutrition Management in the Rural Areas of Chaharmahal and Bakhtiari. 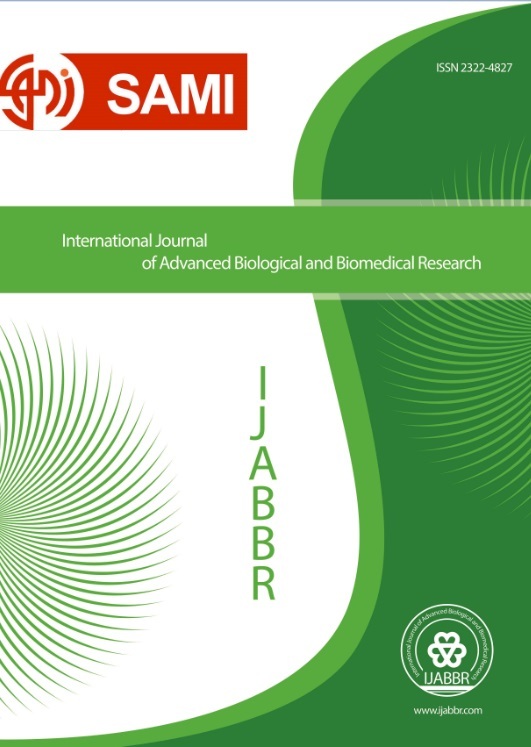 International Journal of Advanced Biological and Biomedical Research, 2(8), 2356-2360. Mazaher Hashemi; Arash Hossein Mirzaei. "The Evaluation Status of Dairy Cows Nutrition Management in the Rural Areas of Chaharmahal and Bakhtiari". International Journal of Advanced Biological and Biomedical Research, 2, 8, 2014, 2356-2360. Hashemi, M., Hossein Mirzaei, A. (2014). 'The Evaluation Status of Dairy Cows Nutrition Management in the Rural Areas of Chaharmahal and Bakhtiari', International Journal of Advanced Biological and Biomedical Research, 2(8), pp. 2356-2360. Hashemi, M., Hossein Mirzaei, A. The Evaluation Status of Dairy Cows Nutrition Management in the Rural Areas of Chaharmahal and Bakhtiari. International Journal of Advanced Biological and Biomedical Research, 2014; 2(8): 2356-2360. Objective: This study carried out to monitor the status of nutritional management and measuring difference between present and desired feeding system in dairy cattle of rural conditions of Chaharmahal and Bakhtiari. Methods: 334 rural flocks consisting of 1442 dairy cows were selected from seven towns of this province. The experiment was lasted for in a year and using completely randomized design. Data of feed intake and production obtained directly and measured monthly. Feed intake sample was collected from all dairy farms and then the amount of nutrients was determined in laboratory. Results: Results showed that type of township had significant effect on net energy lactation (NEL), crude protein percentage (%CP), as well as calcium and phosphor percentage (p<0.05). Highest mean of crude protein percentage (%13.10±0.59) and NEL (1.33±0.03 Mcal/d) belonged to Shahrekord township. Results showed that calcium and phosphor levels received in all units under study were less than the amounts recommended in National Research Council (NRC 2001). So that, Ardal township with %0.66±0.04 and Shahrekord with %0.38±0.01 respectively had highest levels of these two elements as compared to other township. Statistically significant difference was observed between various townships regarding the amounts of Neutral Detergent Fiber (NDF) and Acid Detergent Fiber (ADF) (p<0.05). Numerically, highest and lowest % NDF belonged to Ardal township (%53.74±1.32) and Shahrekord township (%41.31±0.77), respectively. % ADF in Ardal, Borujen, Shalamzar, Shahrekord, Farsan, Kouhrang, and Lordegan were gained %37.24±0.97, %30.67±0.74, %31.60±1.06, %28.59±0.64, %29.66±0.85, %31.56±1.18, and %30.34±0.91, respectively. These indicate the imbalance of dairy cows rations in rural areas. Conclusions: Results obtained in this study indicate that the dairy cattle, based on the recommendations of the NRC, 2001 with a deficiency of protein, minerals and fiber are facing excess usage.